Egyptian military leader General Abdel-Fattah El-Sisi said ousting the country’s first elected president was necessary “to preserve democracy” and resolve the political deadlock that had dangerously polarised the country. But six weeks after the coup he led, the notion that toppling Islamist president Mohamed Morsi would restore stability to Egypt has proven false. When Mohamed Mursi was sworn in as president in June there were concerns that the first democratically elected president in Egyptian history would be subservient to the military council that had ruled the country since dictator Hosni Mubarak was toppled in early 2011. 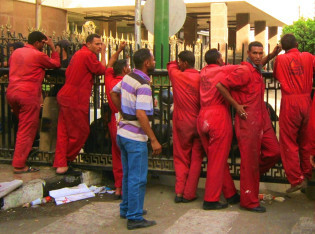 During the uprising that ended Hosni Mubarak’s 29-year rule, Egyptian protesters stormed state security headquarters in Cairo. Inside they discovered a trove of documents – including surveillance reports on activists, transcripts of telephone conversations, and intercepted emails – that revealed the meticulous records the state kept on the activities of its citizens. If the life sentences for former Egyptian president Hosni Mubarak and one of his key allies were meant to placate Egyptians, they have had the opposite effect.